Yesterday, FourSquare announced that they are "joining the OpenStreetMap movement", meaning that the now use OpenStreetMap data for their map tiles. With their own map styles and using MapBox for rendering their styles. This is amazing news I think. Of course, as with many changes, some people are happy but there are others that complain that the map data just isn't up to standards yet for their area. That's a fair point as OpenStreetMap does not have all roads and points-of-interest (POIs) of every city and town in the whole world. The geographical data has mostly been contributed by people on the ground with GPS devices through so called mapping parties. Both in places like London as well as in slums such as Kibera. For a look at the progress over such a weekend, check this video or have a look at "OpenStreetMap: A Year of Edits" for an animation showing all the edits in 2011. Foursquare is all about spamming twitter, I mean, checking into venues to acquire points and badges. OpenStreetMap is all about having a database of geographical data, and that is not only roads! I've written on OpenStreetMap before. A venue is a POI in the OpenStreetMap jargon. It makes a whole lot of sense to keep only one database of these POIs/venues. The venues are added (and fixed) by foursquare users in the first place so getting that data into OpenStreetMap would be awesome. I think this is a great opportunity for fourquare to contribute the venue data to improve OpenStreetMap. I think in this case, there needs to be some form of review process before they can be added to OpenStreetMap, or perhaps consolidated with already existing POI data. This is going be an interesting challenge, and luckily foursquare already is toying with how to improve OpenStreetMap's data. Besides venues, OpenStreetMap also contains roads and in places those roads are missing or don't have names. 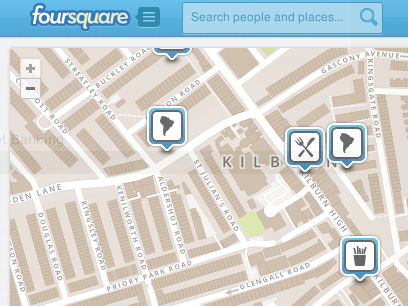 Perhaps foursquare can even sponsor mapping parties in the "empty" areas. In the end, a free-to-use open geographic database is what is beneficial to everybody. For more information on OpenStreetMap, have a look at its wiki or drop by on IRC.